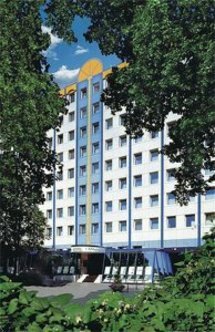 YOUR HOTEL IN THE BERLIN CENTER (MITTE) Close to the cultural and historical centre of Berlin, the hotel HOLIDAY INN BERLIN-MITTE is situated at the 'Gesundbrunnen' underground, city train and railway station of the Deutsche Bahn and peacefully located at the Humboldthain park. Experience the exceptional history of the city in the Berlin Wall memorial park nearby the hotel. With the 'Berliner Unterwelten' you can discover an exciting underworld view of Berlin during a guided bunker tour, just opposite the hotel.The Hotel is situated only 5 minutes from Alexanderplatz nearby the shopping mall "Gesundbrunnencenter" centrality to the fair ground ICC.